UPDATE: Police are still searching for this individual. Additional information can be found here. 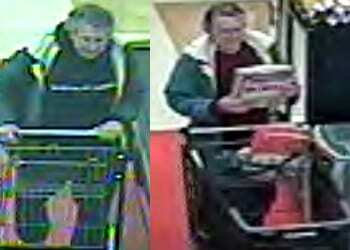 Burglary detectives are seeking information on the identity of a suspect who is using stolen credit cards. The credit cards were taken on December 12, 2016, from a home in the 1200 block of Ridgeshire Road in Dundalk. The suspect pictured below used these credit cards on the same day at the Shoppers located in the Middlesex Shopping Center, 1200 Eastern Boulevard, Essex, MD, 21221. The suspect walks with a limp and uses a cane. It is believed the suspect regularly frequents the shopping center. If you have any information about the suspect, please contact police at 410-307-2020.